“Chapter Fifty-One” is the last new episode of Jane The Virgin in 2016, and that’s the only disappointing thing about it. This is one of those chapters that shows just how rich the show’s three-tiered narrative structure can be when every level has a compelling plot: As usual, Jane is at the core of the most grounded storyline, which focuses on her commitment to her Catholic faith, an essential part of her character from the very start of the series. The script is heightened for Rafael as he begins to remember details of his past that could be beneficial to the police’s investigation of his late mother’s criminal activity, and the writers and director turn to the work of Alfred Hitchcock for inspiration to amp up the suspense. Then there’s Rogelio occupying the most exaggerated level of reality, hunting for a new baby mama by turning to Darci Factor, The High Dollar Love Dealer (TM), who pairs him with celebrities like Denise Richards, Carmen Electra, and Brooke Burke for a series of doomed dates that fail to take his mind off of Xiomara. Writers Sarah Goldfinger, Jessica O’Toole, and Amy Rardin tie everything together exceptionally well this week. Hitchcock’s rules for suspense are introduced on Jane’s grounded level to help her create more tension in her novel, and then the Narrator takes those rules and applies them to Rafael’s story to see how they work in action. While Hitchcock doesn’t play a part in Rogelio’s thread, he also has three criteria to follow thanks to Darci’s three rules for building relationships, connecting his story to Jane and Rafael through a shared motif while highlighting the lighter tone of Rogelio’s experience by comparison. This show operates on three levels of reality, but it wouldn’t work without connective tissue between them. Even though he’s in his own wacky orbit, Rogelio’s actions disturb the Villanueva women when he tells Jane that Xo and Bruce are back together, creating a conflict with more personal stakes. The intrigue surrounding Rafael gets Michael all the more excited to jump back into police work, making it all the more disheartening when Michael learns that he didn’t pass his physical exam and is now relegated to desk duty. Catalina moves between planes of reality in this chapter, which begins with her interrupting Jane’s home life by talking loudly on the phone while the teething Mateo is asleep and eating his teething biscuits so that he can’t get relief when he wakes up agitated. Catalina takes a big jump into telenovela villainy once she leaves Jane’s house and moves into Rafael’s place in The Marbella, a transition marked by the introduction of a suspicious bag full of cash and jewels. Catalina lies when Jane asks her about the bag, and by the end of the episode, the viewer learns that Catalina has a secret French lover whom she recently robbed, situating her in far more fanciful storytelling territory moving forward. It’s not a surprising transition, and introducing a new villain through Jane’s family instead of Rafael’s is a refreshing change that gives the new antagonist a stronger emotional connection to the show’s lead. Jane The Virgin has always been an extremely playful series, and that sense of fun drives this episode. The Narrator plays a big part in that, continuing to offer irreverent commentary but also taking a more active role in how information is presented to viewers. After Jane introduces Hitchcock’s rules of suspense, the Narrator tries out the first one by giving the audience information that the characters don’t have, revealing an envelope that will change the future of this series. When Jane and Rafael find themselves in the middle of a classic suspense sequence at St. Genevieve’s convent, the Narrator increases tension by structuring events according to Hitchcock’s rules while also providing humor by making it explicit that he’s adhering to a specific set of guidelines that work very well in practice. The Narrator makes it easy for the writers to smoothly include overt homages to Alfred Hitchcock Presents, The Birds, To Catch A Thief, and Vertigo because that’s just how the Narrator chooses to depict those moments now that he’s on a Hitchcock kick, and Anthony Mendez’s voicework accentuates the Narrator’s excitement that he gets to “Hitchcock it up” this episode. The Hitchcock elements give director Gina Lamar and cinematographer Lowell Peterson the opportunity to move away from this show’s established visual style to evoke the look of Hitchcock’s films, and it gives the Rafael storyline a dramatic weight that isn’t always present when the show ventures deeper into crime genre territory. Like Hitchcock with a pretty blonde, Lamar includes plenty of close-ups of Rafael’s chiseled face to spotlight his confusion and unease as he begins to piece together his childhood memory, and Justin Baldoni’s performance captures Rafael’s sense of dread as he begins to feel the existential importance of this secret from his past. He doesn’t know what exactly is going on, but he knows that it’s something that will mark a major change in his life, and Baldoni projects Rafael’s fearful curiosity, hungry to discover the truth but nervous about what he’ll learn. His anxiety is justified when he learns that he’s not actually his parents’ son, but was born in Italy and given to Elena Di Nola when she lost her baby. Rafael’s parents are still out there, and it’s a safe bet that his birth family is going to cause trouble down the line. The camera angles in this episode are more dramatic and imaginative, like the shot showing Mother Superior Constantine entering her office, reflected through the paperweight on her desk. When Jane’s phone fails to send a warning text to Rafael, the camera switches to the overhead God’s-eye-view shot that Hitchcock was very fond of, and using this shot in a convent, just before Jane is about to come clean about the growing distance between herself and her God, is an extremely clever visual choice. In the midst of all the Hitchcockian suspense, this episode tells a meaningful story about Jane’s struggle with her religion, and the reason she’s so adamant about getting Mateo in church at his young age is because she has doubts about her own faith. While Jane fails at preventing the Mother Superior from walking in on Rafael in her office, she does get to have an eye-opening conversation with one of the other nuns in the convent, who asks Jane to think about why she hasn’t been to church recently. Jane is so focused on moving forward in her life that sometimes she doesn’t allow herself time to fully process major events, and her lingering anger at God over Michael’s shooting comes to the surface when she considers the moment that tested her faith. 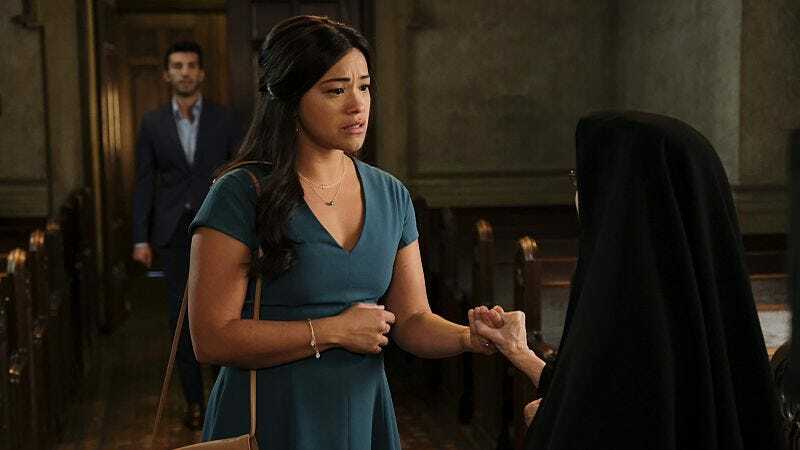 With all the horrible things that have happened to Jane and those around her, it’s easy to see how she would resent the Supreme Being that is supposed to be watching out for her, and Gina Rodriguez fully commits to Jane’s pain, which stems both from the memory of Michael’s shooting and the realization that she’s losing her connection to God. It’s a whirlwind of emotions realized with sensitivity from Rodriguez, and once it settles, Jane sees her situation with new clarity. She needs to strengthen her own relationship with God before she forces Mateo into one, and this realization is Jane’s first step in getting closer to her Lord. This is the second episode of the season with no Petra, and while it feels like a missed opportunity to not incorporate this show’s blonde bombshell into a Hitchcock episode, her absence leads to a tighter episode because the writers are dealing with fewer moving parts in their script. The “Jane Villanueva Presents” sequence is great for a number of reasons including the costuming, lighting, and Jane’s salad bowl belly, but Brett Dier’s Jimmy Stewart impression is the highlight. Bruce didn’t lie to Xo about his wife when they first got together, and she pursued a relationship despite the knowledge that he was married. Xo tells Jane so that she’ll be less hard on Bruce, but it significantly diminishes Jane’s opinion of her mother. Michael and Rafael’s new friendship is wonderful, especially when they team up to disagree with Jane. This show is very smart about allowing personal relationships to evolve over time, and while it looks like the criminal activity in Rafael’s past will add more tension to his new bond with Michael, hopefully it doesn’t snap their connection. I was a big fan of Justina Machado on Six Feet Under, so I’m excited for the prospect of her in a recurring role as Darci Factor, potential mother of Rogelio’s next child. Her instant chemistry with Jaime Camil telegraphs that they’re going to be paired up by the end of the episode, and there’s potential for real romance between these two characters. Narrator: “Speaking of subtle hints…” Rogelio: “Mmm, what a miracle that my Tiago product integration has given me my new favorite cereal.” Xo: “It is super delicious. (Pause.) Subtle is overrated, just kick her out.” I love this show’s integration of Honey Bunches Of Oats into the action. It’s so much easier to accept product placement when it’s played for laughs.